The shining example of affordability. 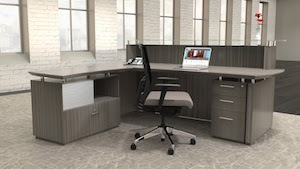 This contemporary laminate office furniture combines both beauty and functionality. The 1 5/8î thick work surface has a beveled edge that blends harmoniously with its' distinctive curving work surfaces. The sliding hutch doors and modesty panels are made of 3/16î thick acrylic. Modular hutch design enables left or right hand configurations, or can be wall mounted. Our office furniture specialists will help you choose the right reception desk and office furniture to fit your company's needs, as well as your budget. To complement your reception desks, we offer many choices of lobby chairs, small tables, and sofas. 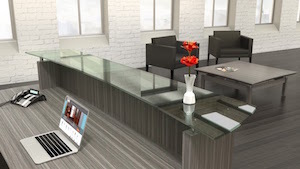 Reception desk furniture is highly visible and it must be durable. If you choose the right reception desk and furniture it can make the image of your business long lasting. You get only ONE opportunity to make a first impression to your customers - with the Mira reception desk you can make it a good one and save time and money in the process! 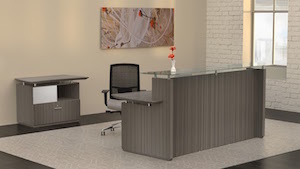 Our office furniture specialists will help you choose the right reception desk and office furniture to fit your company's needs, as well as your budget.